It is hard to stay on track each day if the first wake up time of the day is off. When baby is waking too early, it leaves you wondering what to do. Here are some causes and solutions to when baby is waking too early. Chapter three in Healthy Sleep Habits, Happy Child is all about common sleep problems and how to fix then. Today we will be talking about your child’s morning wake up time and what to do if it is too early (this starts on page 119). The Sun: Two of my three children are easily woken by the sun in the AM, so I know this is a reality. Get some window-darkening shades. At our house, we have dark wood blinds that help keep out the morning sun. Our blinds are special blinds that do not have holes in them to let the sun in. We got these at Home Depot. Some people have used everything from aluminium foil to blankets. I have heard that Home Depot has blackout curtains, and I think Joannes? If you have some room-darkening item, please comment and share what it is, where you got it, and if you like it or not. See also Early Morning Waking and the Sun. Noise: Noise is another common reason for you child to wake earlier than he is ready to in the morning. This can be noise from cars on the road, your husband getting ready for work, or your dog barking at the sun rise. Weissbluth suggests you get a noise machine or a humidifier to counteract the problem of morning noise. We have humidifiers in each child’s room. We got them for 20-something dollars at Walmart. They aren’t the best quality, but they have a nice gentle hum to them. Of course some of you will live in a climate that is humid and you don’t want more humidity in your home. You can either use a noise machine or a humidifier without water in it. Fussiness/Colic: “The most common cause for waking up too early before four months of age is extreme fussiness/colic” (page 119). Bedtime Too Late: “The most common cause, after four months, is too-late bedtime” (page 119). The answer to this one is simple–move bedtime up earlier. I often get questions about a baby waking early who is going to bed at 9 PM or later. 9 PM is a bedtime none of my children have yet to see–it is too late for a child. If bedtime is too late, slowly move it up earlier. I like 10-15 minute increments. Your child should easily and quickly fall asleep. It might take some time to figure out the exact right bedtime–make a change and wait four days (unless it is totally obvious to you this was wrong). A hint is that most babies have bedtime in the 7 PM hour–some maybe about 6:30. Shooting for anytime in the 7 PM hour should get you close. Hopefully these ideas help you figure out why your child is waking early in the morning. Next Post My Memories Winner! We're on an 8 to 8 babywise schedule like clockwork. If we need to stay out past 9 – they're happy with that too. I wouldn't say 8pm is a magic time. Just depends on your schedule. Babies could do a 10-10 babywise schedule if it was consistent from day 1. My twins don't have a problem, exactly. They sleep 12 hours, which is totally awesome, but it's 6-6. The problem is I CANNOT get them to stay awake one minute past 6 without wailing and gnashing of teeth. Not sure what to do about that. I'm not a morning person at all, and I would love a 7-7 schedule. They are 6 months old. Any ideas? I have tried everything under the sun and my 10 month old will not sleep much past 6:00. It's very frustrating and tiring. While I wholeheartedly agree that a later than normal bedtime negatively impacts morning waketime, I do not agree about an arbitrary time being "too late." 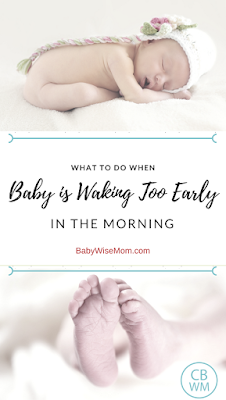 I started BW when my daughter was 4 months old, and the first thing I did (per the instructions) was pick my morning wake time. I chose 9am because it fit well with our schedule. My daughter is now 2.5 years, and has been sleeping 9am-9pm most of her life. It works great for us. I bought black out curtains at ikea. Black on one side Dark gray on the other…. We love them! My baby's (6 months old yesterday)wake time is 8am, but she rarely makes it to 8am SO I am going to try and move her bedtime earlier to see what happens. 🙂 She naps (3rd nap of the day) from 5-6:30, then she eats at 7:30 and has bath and is in bed at 8:30pm. She had a DF still at 11:30pm. (I have tried to make that earlier, but 11:30 seems to be our 'magic time'. )My plan for now is to shorten her 3rd nap by 30 minutes (so from 5-6pm) and then have her in bed at 8pm. The reason I have not made her bedtime be 8pm in the past is because we are out two nights a week and an 8pm bedtime is hard to achieve. I guess I was thinking that consistency with bedtime would be better than having two nights of 8pm bedtime and 5 nights of 8:30pm bedtime. What is your opinion. And then, of course, we could also try to leave our activities half an hour earlier to get on home for bedtime routine to have her in bed by 8pm. I have a 2.5 yr old whose bedtime is 8:45. Waketime is at 8:15am. She has been on this schedule since probably 18ish months. Can't remember exactly for sure. I do know that her bedtime was at one time 8pm, then it moved to 8:15, 8:30 and stuck at 8:45. This is all very interesting! Thanks for this post, Valerie! HSHC and Weissbluth's blog talks about how the timing of sleep is important. So a LO may be sleeping 12 hrs but if it is late and night to late in the morning it is not as good/healthy sleep. He says it is all rooted in science and it's biological. He quotes some other cultures where kids are out late and sleep in til noon, but it's not as restorative as say a 7-7 even though it's 12 hrs. Interesting. And he also talks about how shift workers who work nights and sleep during the day have issues such as abdominal pains, headaches,etc because it's not really the natural way (obviously sometimes necessary though). Anyways I thought it was really interesting and I do think from experience there is basis in that. We bought black out shades from blinds.com. Easy to install yourself. Laura, I think that is very true of most kids. Brayden was always that way until he was probably six. My girls can actually sleep in the next day if they are up late the night ebfore–especially McKenna. Jennifer, does your area observe daylight savings? If so, I would just wait until then (two weeks form now) and what is now 6 will be 7.If not, see my posts on "time change" for ideas on how to move times slowly. I actually agree that for most babies, bedtime before 8 PM is the best idea. Some are more flexible, but I believe the science behind circadian rhythm is true. Dave and Elaine,I think having five days at an ideal time is more important than having beddtime the same time every night. But you might also try dropping the dreamfeed. At some point, the baby gets old enough it starts to interfere with nighttime sleep. Yvonne, I have read research shows every hour of sleep before midnight is equivilant to two hours of sleep–so for every hour you are sleeping before midnight you are getting double for your "effort. "I definitely am a believer in "early to bed, early to rise. "–not only scientifically, but I have religious reasons behind it, too. Thanks everyone for your black out blinds tips! Hannah,Try moving your dreamfeed earlier. Having it after 11 PM can disrupt night sleep. Also, at least if you are moving to a swing for a little while, you are breaking a need for food at that time of day. Hey there! I posted a question about 2 weeks ago…just checking to see if you were notified! Thanks! My daughter will be 7 months tomorrow and she has NEVER had sleeping issues. She has been sleeping consistently through the night until my desired waketime since she was 8 weeks old and has rarely waken in the night since. BUT, this past week she has been waking WAY early than usual in the morning. I didn't think to move bedtime up because it's been the same forever, but maybe I'll try that first. Also, she is currently on a 4 hr schedule, sometimes she goes 4 1/2-5 if she's taking a real good nap. She takes 3 naps, the first two averaging about an hour and a half each, sometimes longer. It also depends how loud my house is during those naps. Her third nap is usually at 6:30-7:30. I have been waking her lately at 7:30 so she doesn't sleep too much and then not be tired at bedtime. After she wakes, she plays for a bit while I put my 4 yr old to bed at 8 and then by the time I get to her and nurse her and put her back to bed, it's anywhere from 8:45-9. So, I'm thinking either this is too late, or her 3rd nap is too late. She wakes from her second nap between 4-5 and there is no way she'd make it to 8:30 (unless we're out and she's distracted). I'm hesitant to put her to bed before 8 because that would be a huge difference than what she's used to, but maybe eventually, that's what she needs. If she went to bed for the night at 7:45, per say, she might not need a 3rd nap. She's also not been fed this early in the night as the last feeding of the day, so if she still woke early in the morning, I feel I wouldn't know if it was hunger related or sleep related. And I'd hate to add a dreamfeed at 7 months, especially after not having one for so long. This is our current schedule: 8-8:30 nurse and solids, nap around 9-9:30; 12-12:30 nurse and solids, nap around 2-2:30; 4-5 nurse and solids; nap around 6:30; nurse around 8:30 then bed. The variations in exact times of naps and feedings is due to have to take and pick up my 4 yr old from school only 3 days a week. I'm wondering if I started putting her to bed early, would giving her solids at 4pm be too early to make her last the night? Is it normal to give a little cereal at 7:30 or is this over feeding? She has been so consistent for so long that I'm confused now that this behavior is so different and at an older age! Thanks!! Stephanie, I think there is a good chance too late of bedtime is causing issues. Solids at 4 is a great time.If she still needs a third nap, you can just shorten it to 45 minutes, feed her again, then put her right back to bed.This can also be due to teething or other reasons listed in the "5-8 month sleep disruptions" post, so be sure to see that one. My dd is 7 months, eating 4 hour schedule, eats solids 3 times a day. She takes 2 2 hour naps and sometimes a last nap for 45 mins (I won't let her sleep longer than that) she just cut her first tooth, so I think we're past that. My problem is early wake time. She use to be 7pm-7am…then she started waking at 6:30…and now it is 5:30 am…We still put her down at 7:30/7:15 and she falls asleep by 7:15-7:30…any suggestions on how to get her back to 7 am? Thank you. Tiffany, the trick is figuring out the reason why she is waking and then fixing that reason. I have a post on early waking for 5-8 month olds that should help you out. I need help with my wake time! LO is waking up consistently around 6:20-6:40 a.m. I would like it at 7:30 a.m. We were putting him to bed at 7:30 and moved it up to 7 after researching, however it didn't help. He's 7 months, isn't a 6:30 BT too early? ?Any suggestions? Is he just 'one of those babies' who don't need 12 hours? Should I try 8 p.m. BT? I am having the same problem with my 8 month old. He has never slept 12 hours. He was down to 2 naps from 6 months until this week but his naps started getting shorter and shorter so I added a 3rd nap in because he wasn't making it until bedtime (7pm) and was still waking up between 5:30 and 6:30am. Now he takes a 3rd nap and I try to have him in bed by 7:30 or 8 but he is still waking up at 6:30 am. I try to leave him in there to talk until 7 but then he wakes my 2 year old up with all his fussing. She always sleeps 12 hours but the past 2 weeks he has been waking her up an hour earlier than her normal wake time, and she won't go back to sleep, so they are both extremely cranky all day. I don't know what to do! My 7 week old daughter is on a pretty consistent 2 1/2- 3 hour schedule with her wake time at 7:30. She is going down at night at 8. I have been cluster feeding her at night to help her sleep better (at 4,6,8 &10) she goes right down after the 8pm feeding but consistently wakes up right around 6:20am daily. I put in blackout shades (no luck), there are no environmental factors,I have fed her and tried to put her back down (no luck.) So what do I do? Do I allow her to set her wake time to the 6:20(not at all what I want to do!)? Should I try moving her bedtime back to 7 and go to a 4,7,9,11 schedule? She is only sleeping 5 hours max at night. Thanks for the help! Forgot to mention…she was born at 37 and a half weeks. I am not sure if that affects it or not. I'm in the same situation with my 8week old and would love some feedback! Help please I hate to let her cry it out for more than 30mins just to wake her again within the hour! Hi!I have a 6 month old who has been Strn since 7 weeks. She usually sleeps until 6 or 615 when we feed her before my husband goes to work, but for the past few mornings she been up at 5. She didn't nap well the day before, she still has a problem with the 45 min nap even though we adjusted her wake time to 140. She goes to bed about 830. She takes an early morning nap, one at 11 and one at 2. She usually refuses to nap in the evening. Any suggestions? Thanks! My almost 19 month old daughter is waking earlier than I would like. We've been babywise believers since day one…she started sleeping through the night at 12 weeks and continues to do so. She has been getting up at 6:00. She used to sleep until 7 or later (which would be ideal) until recently. I'm not sure what has changed except the days are now long. We have black out shades in her room and a sound machine, so light and noise are not an issue. She goes to bed at 8:00 (is that too late), nap at 1:00 and sleeps anywhere from 2-3.5 hours for her nap. Any suggestions would be helpful. Thanks. My 3.5 month old is on a 3HR schedule so his evening feed is at 6pmish. He has decided his bedtime is 7:30-8PM. He will NOT eat then and will not do a 10PM DF. He wakes around midnight to eat. He will often wake at 5 and sometimes eats and sometimes back to sleep. His 7am and 9am feedings he rarely eats much. I like the 7am wake and the 3hr schedule but the midnight feeding needs to go 🙂 I can even handle the 5am-I think he is fading away from that already. I have 6 month old twin boys and we have been following Babywise since Day 1. They have developed into fairly good sleepers-naptime and nighttime but my question is this..how much attention do you pay to the sleep totals that babies need at various ages? I have read in many books (including Healthy Sleep Habits happy Child/Twins) that at this age they need about 14 hours total sleep. This means that with 3 naps at about an hour and a half to two hours each, they would only need about 10 or less hours during the night which means going to bed even at 8:00 gives them a wakeup time of 6am. I noticed somewhere in your blog you mentioned a 2 hrs up and 2 hrs nap schedule for your babies-which is pretty close to what is happening at our house..if I let it, but Im always nervous that 6 hours of naps during the day will cause for much earlier wakeup time-or I need to push bedtime later than 800. Right now we are on a 3.0-4.0 hr schedule with 5 feedings a day at 7am(wake time),1030,230,530, and the last one being at 730. Im torn between following sleep totals and just letting them nap however long they want? Not only that but pushing bedtime would be tough since they wake up from their last nap at 530pm and by 800 they are ready to meltdown if we dont put them to bed. Help! PS-Love love love your blog! My 4 month old was going to bed around 10pm every night and was sleeping till about 6:30, but the last few nights he has been waking up between 3 and 4am and then eating and going back to sleep till about 9. Any advice on how to get him sleeping through the night again? Could an earlier bedtime do the trick? Bethany I would definitely try an earlier bedtime. See also the info on four month sleep issues. See the posts on 4 month sleep issues for ideas. It could be the 19 week wonder week. Also, I recently needed to start dressing brinley in slightly warmer pjs for night so that could be it too. Hi my gal is 7+ months. It's my 2nd time doing babywise. Baby wakes at 6am every morning and play by herself. Since day 1 I've been waking or rather feeding her at 7am. So she plays for an hour before her feed at 7am but gets tired n fall back to sleep at 830-10am. My ideal would be 9-11am as she is on 4hr feed. If I push back her nap later she still wakes at 10am. What can I do to adjust this? She is sleeping thru the night from 7pm. Tx for reply! I stay in Singapore. I have an 11 week old baby girl (7 weeks technically as she was born 4 weeks early). I always keep in mind that she may reach her milestones later than usual. In the past week, she has merged her nighttime feeds and wakes at 3am to feed. She goes to bed between 7 and 730am and I dream feed at 11pm. She sleeps very well from 7/730-3am, but in the last week since she merged her feeds she has been waking up at 540am for the day. HELP! 540 is way too early. I tried feeding her and she wasnt interested. I let her lay there and she can go until 7am before feeding again, but shes AWAKE. By 730, shes ready to nap. What am I doing wrong?! Correction…. she goes to bed between 7 and 730PM…. typo. Hi, recently discovered your site..super helpful! I am a new mom following BW and have a 4.5 mo old that is waking early in morn like 6:15 or so when it used to be 7 which is when I start the day. We put him down at 8 pm and he barely makes it to 8 sometimes but I am a bit nervous to put him down any earlier. Maybe it's the 4 mo regression I keep hearing/reading about because naps have been a huge struggle the last week. Thoughts?Thanks! I should've noted he is still on a three hour schedule feeding at 7,10,1,4and 7 roughly so that's what he's been going down at 8pm because by the time we feed and burp and keep him upright a bit due to reflux it's close to 8. He is 20 weeks old and was born two weeks early. The 45 minute nap intruder has also been brutal for about three weeks and still strong! It definitely could be the four month regression. It also could be that he needs an earlier bedtime. But if he has had that bedtime and was fine and now isn't, I would lean toward regression. Hi Valerie, my son is almost 15 months and has until recently been a 12 hour sleeper (sometimes longer if I didn't wake him). His bedtime was 7:15 pm. A few weeks ago he began waking early, between 6:10 and 6:40 am. It was about that time that I noticed that he had two big molars coming in on top too. The days are also getting long here (MN) so I thought maybe the sunlight was waking him and went and got him blackout curtains. They didn't help. He also started taking about 30+ min to fall asleep when he went to bed at 7:15, which is very unusual. He is always asleep almost right away. I moved his bedtime up to 6:45 pm and added his morning nap in every day to make up for lost sleep (we were doing some one nap days since he seemed to be dropping it). He falls asleep faster when he goes down earlier but wake up time is still early. Also, we are traveling next week to another time zone one hour behind us and then moving shortly after that to that same time zone, so I need to move his bedtime back so that he is not going to bed at 5:45pm every night! I've started adjusting his bedtime about 5 min later every night but wake time is not moving later at all. Am I doing the right thing here? I'm not sure if it is the teeth bugging him and that after they come in he'll sleep better again…but he is SO crabby, especially in the evenings that I'm concerned about him not getting enough to rest. I have to move his bedtime later regardless but am worried about him developing a sleep deficit. Am I missing something here that could be adversely affecting his sleep? We keep the house as quiet as possible in the mornings, but my husband does get ready for work around 5:30-6:00 am. He's as quiet as possible. Our son has white noise in his room. His room is temp controlled, so he's not too hot or cold. Diapers are ok–not too wet or soiled. I'm just so confused about what suddenly changed his sleep pattern! Thanks for your help and your blog!